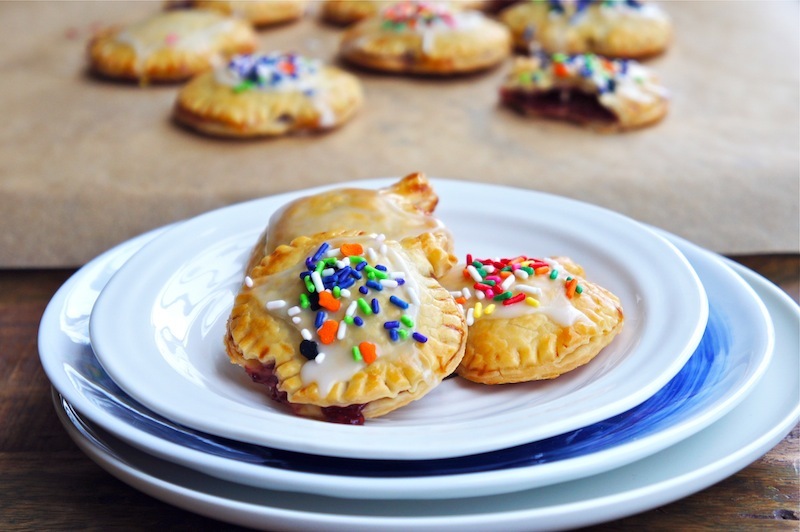 These Pop Tarts are the current hit with my kids. It's incredibly simple to make and tastes fantastic! I used store-bought refrigerated pie crusts which worked well with their favorite jam or spread. We tried various jam flavors and peanut butter; in the end, we all agreed that the raspberry jam tasted the best. This is a fun taste experiment to do with your kids. 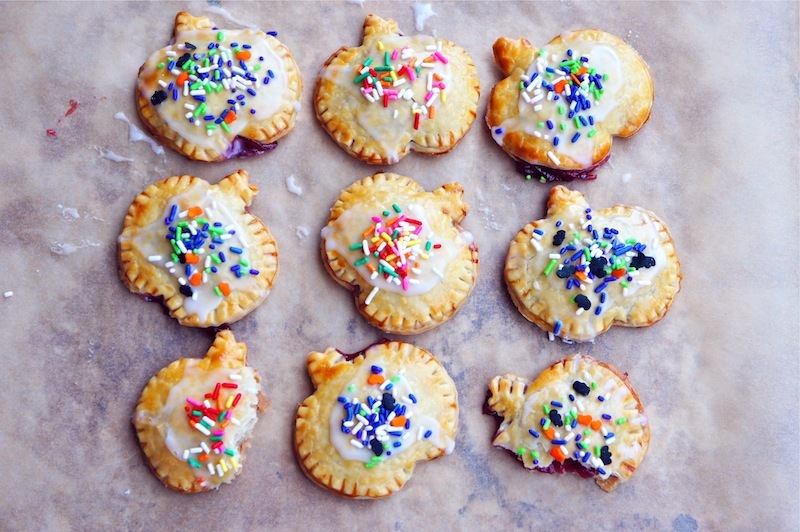 Since Halloween is just around the corner, I thought it would be fun to use a pumpkin shape cookie cutter, and topped-off the tarts with some colorful sprinkles. So, do play with the different shapes and variety of jam when you are making this. Have fun! Preheat the oven to 375˚F/190˚C. Unroll the pie crust on a lightly floured work surface, cut the dough into desire cookie cutter. Fill about 2 tsp of raspberry jam in a mound in the center of the dough. Lay the second dough on top of the first dough and gently press down all edges with your fingertips. Then seal the edges with a fork. Brush the top of the dough with egg-wash.
Place the filled dough on a baking sheet, and bake for about 17 to 18 minutes or until the pastries are golden brown in color. To make the lemon glaze: While the pastry is cooling, in a small bowl, whisk together the confectioners’ sugar and enough of the lemon juice to make an easily spreadable, smooth glaze. 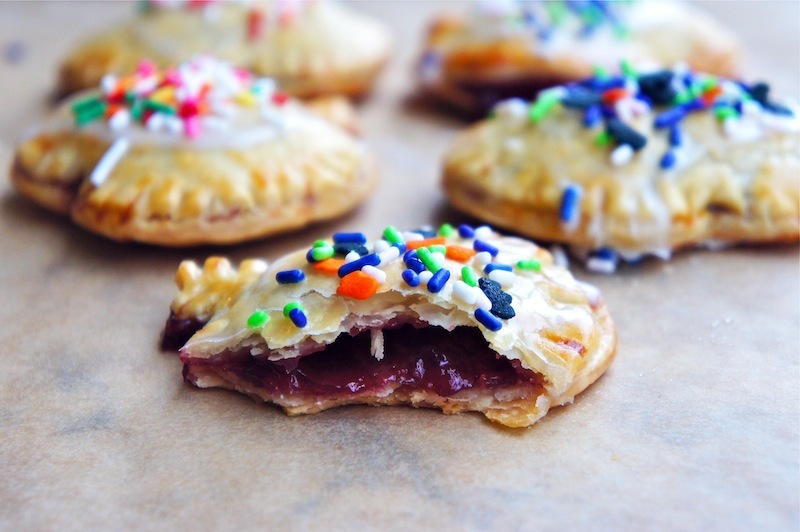 Spoon the glaze on top of the cooled pastry and top with your favorite sprinkles. These sound super yummy and tasty! Can't wait to try these little guys out! These look adorable and cute. My kid would love this :) nice photos. Nutella would sure be another one of their "favourite jams" ? :) These looks happy tarts! So creative! I love the look of pop-tarts in pumpkin form. Super cute.